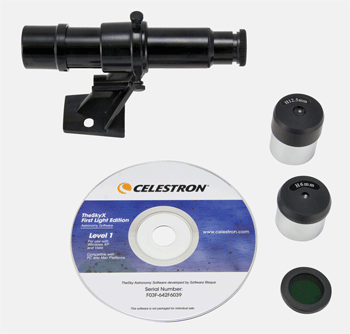 The Celestron FirstScope accessory kit is designed primarily for expansion of the FirstScope telescope, however, it contains 1.25" lenses which can also be used on other telescopes. Also included is a Moon Filter (1.25") that reduces the brightness of the moon and increases the contrast, so the images appear more detailed. The kit comes with a 5 x 24 viewfinder: this can be attached to the FirstScope telescope with a bracket without need for tools. The small magnification and large field of view makes it easy to locate celestial bodies. This CD-ROM teaches you the basics of astronomy. With this software, you can print a star map, and it helps you to identify planets and stars. Write a review By sharing your experience with the Celestron FirstScope Accessory Kit, you can help others (perhaps still doubting customers) with making a good choice.